John says that this one is proving a real puzzle. He isn't sure which railway so the LNWR is only a possibility. The board to the right states: PASSENGERS FOR xxxxxxx AND THE NORTH MUST CROSS THE LINE BY THE BRIDGE. BY ORDER. The critical word cannot be read. The only other sign visible is BOOKING OFFICE. Any thoughts would be welcome. The architecture is typically Scottish, and the double-ended goods brake van with three panels and no diagonal struts looks like Caledonian Railway to me. I expect that the Caledonian Railway Association would be able to identify the location. My guess (doubtless wrong!) is Symington. Presumably the date is June 1911, celebrating the coronation of King George V.
What a nice picture. I have no idea of the location, sorry, but that looks like a goods brake van in front of the building and to the left. If so, then it's about 18-20ft long and double ended; a verandah at both ends. That should narrow it down a little and if I'm right it rules out the LNWR. The chimney is almost in the centre. I have seen this building and I think it is now a restaurant with the station platform and rail still at the back of the building. The annoying thing is I don't know where but it was other than somewhere north of Essex!! Definitely not Dumfries, which like most G&SW stations was a smaller building than this. Still stands and can be viewed on Google Earth. Is west Cumberland another possible location? The stonework looks similar to the red sandstone found on the M&CR. Definitely not Maryport, Whitehaven or Workington. No other large(ish) stations in West Cumberland. This is definitely Workington Central on the Cleator & Workington Junction line. I had originally dismissed the idea of Workington Central because the building was too large, but of course it was also the company headquarters. It is now possible to make sense of the mystery word on the sign - SIDDICK - although the letters are very blurred it certainly fits such shapes as can be seen. At the bottom of the page on the Cleator & Workington Junction Railway (Stanley Jackson) web site there is a sketch of Workington Central. Although it is only a pencil sketch I think the architectural details fit the photo well enough. I think we can safely assume the picture IS Workington Central. My photograph, taken on April 6th 1970, is here. I can confirm that is definitely Central Station - the headquarters of the Cleator and Workington Junction Railway. For several years I passed by this station going to and from Infants and junior school and at weekends it was our local playground. Unusual architecture for a small railway and the openning of this station must have been the catalyst for the L&NWR rebuilding their two stations in Workington. I have been researching this station for many years and have produced 4mm scale drawings of the station building in both its early and extended forms. Looking at the left hand side of the building can be seen the 20th century extention, added some time between 1900 and 1911. The roof shape changed a lot with the extention and the 2nd gable was added giving the building a more balanced look. 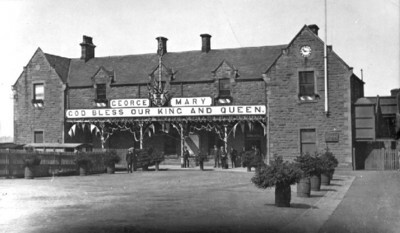 The station building was started in 1878 and was finished the following year when the line was officially opened, but the nearby road bridge just out of view was built later. One can just make out a capping stone for one of the wall pillars. The roadway (New Oxford Street) climbing up to an overbridge was built a few months after the station was brought into use. A stairway linking the new road and the platforms was added but passengers had to use the road bridge to cross the tracks. The bridge is no. 44 in the LMS bridge register and is still in situ today. During the World War II part of the building was taken over by the War Department and used as a Naafi. It was also used by Pickfords as an office and furniture store. The railway was closed to goods traffic in 1964 and around this time it became the workshops for a retail radio & television firm called Aurthur Hughes. The service manager was a personal friend of mine and I used to visit the building at least once every week. I was allowed to go exploring in the unused rooms and rescued some interesting CWJR and LMS paperwork that could have been thrown away. A new road and a church now occupies the site. The brake van obscured by the bushes and fence looks to me like a Furness railway one. The end detail is wrong for an early C&WJR brake van. Photos of any brake vans on the C&WJ are very rare so this is wonderful.